Here are some photos of one of our weddings from a couple of weeks ago. Rachel and Jim had an outdoor wedding at the beautiful Cafe DeMenil. 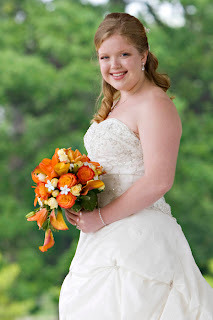 Rachel carried calla lilies, Asiatic lilies, roses, and spray roses in shades of oranges and mango, accented by pearled stephanotis–all in a tear-dropped style bouquet. 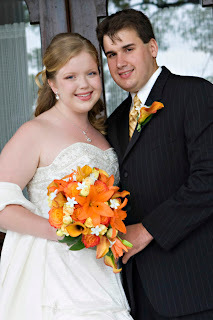 Jim’s boutonniere was a calla lily with pearled stephanotis. A special thanks to Christy Ricker with All Dressed in White for planning a memorable day for the bride and groom.